For as long as I can remember, the axiom violence doesn’t pay has been unable to entirely reconcile itself with adventure gaming. Half the time, the period or setting has merely acted a means of diversifying the weaponry with which the player may bosh hapless foes. But the times they are a-changin’, and Yonder: The Cloud Catcher Chronicles is one of the most compelling advocates of adventuring in its pure form, and a lovely surprise to boot. ​It can best be described either as a combat-free Breath of the Wild or an open-world Harvest Moon, though neither summary quite does the game justice. 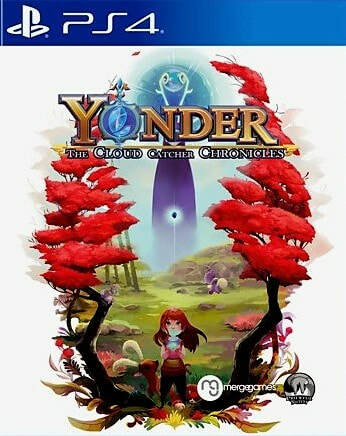 Yonder unfolds amidst the bright, lush world of Gemea, where exploration and resource-collecting are your chief goals. The map branches out in all directions and you’ll discover lakes, mountains, caves, mines and settlements along the way. The player’s umbrella task is to free the land of the ‘murk’, a malevolent miasma that prevents access to certain structures and routes until it is cleared by the collective resources of the land’s sprites. The rub is, you’ll need to find and free these sprites if you’re to make progress, and this is achieved through completing puzzles and missions, or just by having a keen eye. 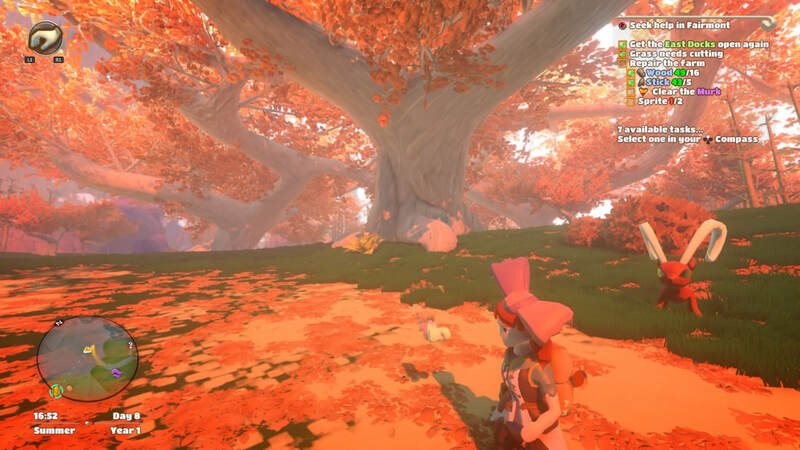 Yonder is chocked full of pretty sights, and seasonal-dependent wildlife and weather ensure it creates a tangible, evolving game world. In the early stages, you’re left somewhat to your own devices, as beyond the opening few, tutorial-style tasks, there’s no clear indicators of where some of the initial sprites may be tucked away. At this point, Yonder feels in danger of petering out, of losing the player’s thread. Stick with it though, as once you’ve managed to secure a couple of the illusive sprites, it really gets its teeth into you. ​Whilst the character models are conspicuously basic, Miiverse-looking creations, the landscapes suffer no such issues, and are positively idyllic. 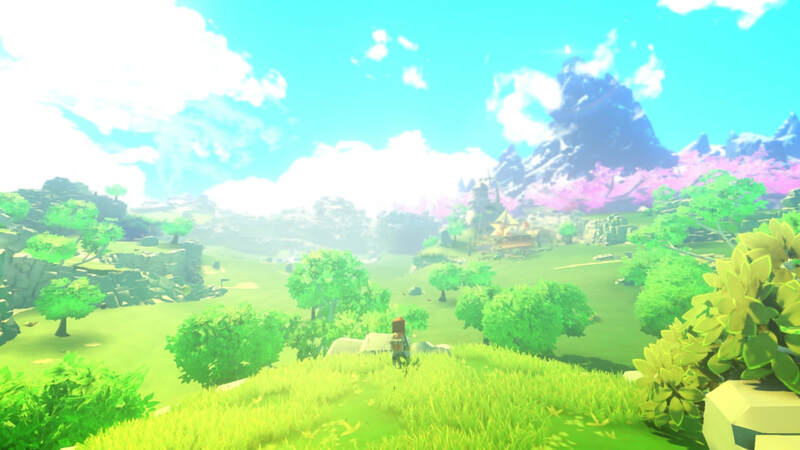 Yonder is resplendent in its bright, lush, natural surrounds. It captures the simple joys of exploration, and gets the small things right. Hauling your way through a labyrinth of caves to discover a village, tucked snugly within. Seeing the sun rise from a mountain top. Surviving a storm as you fish for an illusive freshwater catch, or seeing nightfall descend amidst the charming, lantern-lit villages. Moreover, it garners moments of real satisfaction, such as spotting unusual trees growing where earlier you had planted their seeds. Or seeing a farm develop around the troughs, pens and cotton spinners crafted from the materials found over the course of your journey. Without combat, there was a very real possibility that Yonder might seem lightweight, or insubstantial. If anything, the opposite proves to be the case. Complimenting the myriad of find-and-fetch quests, there’s a superbly in-depth crafting system, an enjoyable fishing game (catching the monstrous Gigalev is quite an achievement), and even the option to grow crops and rear animals on your farms. Managing your materials is an art unto itself, and the bartering system, which simply requires a swap of equivalent value, is a terrific idea. Depending on the needs of a particular village, the value of certain goods can fluctuate, though you’re given plenty of hints from the inhabitants of Gemea. Environments are inviting to explore and the map a clear and useful tool, with a reasonably accessible inventory system. Yonder also enjoys its lighter side, with a number of touches that raise a smile. Every autumn season, Halloween decends on one particular village, where you’ll find a trick-or-treat mini-game complete with spooky costumes, ominous lighting and ghoulish effects. For those who like a spot of customisation, there’s a marvellous array of clothing and bonkers hair-dyes, as well as a quirky mission that sees you assembling seasonal-specific outfits for a fashionita scarecrow. There’s even a collection quest that sees you helping to return a lady’s cats from around Gemea. All 55 of them. Prideful Sloth have adopted a novel means of tackling the issue of internet trolls: they’ve all been sent to live together on a rock, by the sea. It takes a fair bit of finding, as the player must assemble two bridges on the west coast of the map in order to access it, but it’s worth the effort for the laughs. 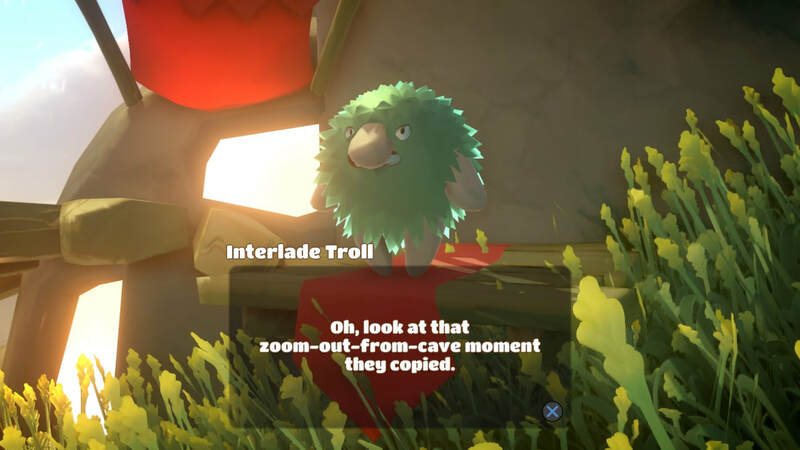 You’ll encounter a group of ‘Interlade Trolls’, each armed with their own scathing put-down for Yonder, addressing such hot topics as the game's perceived lack of challenge, and the similarity its opening bears with that of The Legend of Zelda: Breath of the Wild’s. 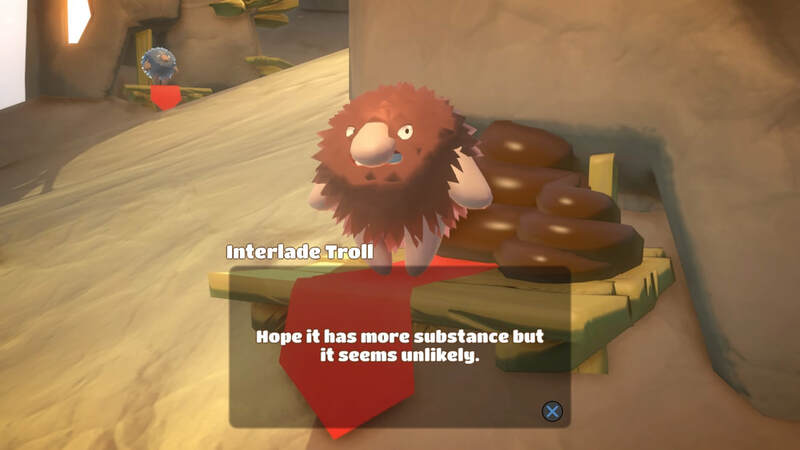 Though you’re encouraged not to feed the trolls, they can be put to good use in helping look after your farms. See? There's always a silver lining. It’s incredibly moreish, and very rewarding. With tonnes of quests to undertake in every village, there’s always a sense of purpose to your trekking. It’s perhaps marginally smaller in scope than some other open-world adventures, though this isn’t necessarily a bad thing. 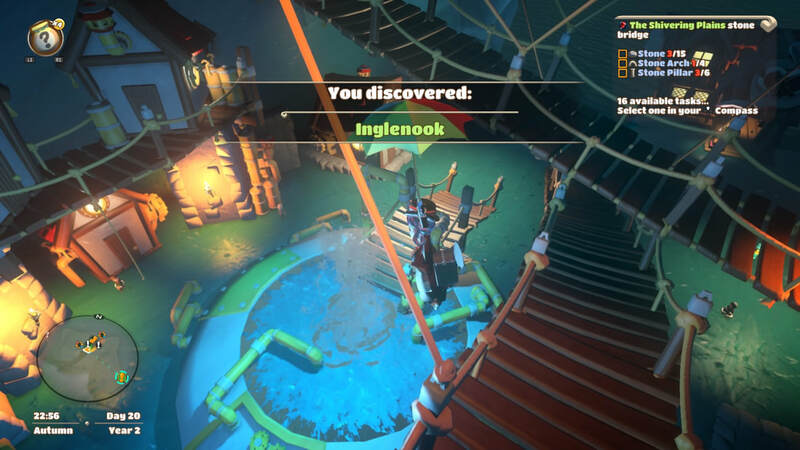 Yonder doesn’t pad too much, avoiding for the most-part instances of having you walk from one side of the map to the other in consecutive missions, a common folly of the genre that can lead to boredom. There’s a fast travel function linking all the farms the player has discovered, which is increasingly handy as the playing area expands, as well as eight connected sage stones typically positioned around the outsides of the map. Whilst the latter can be a rather convoluted means of moving from place to place, the two systems works relatively well in-tandem. There’s little to fault with Yonder, with the only real gripe being that the farming aspect, which is actually fairly strong unto itself, is never really capitalised on. Near the beginning, you’ll establish your first farm, and it appears that there’ll be plenty of scope for quests involving tracking down rare animals or seeds, or establishing and building your enterprise. Curiously however, the farming has very little involvement in any of the main or side missions, and nearly all of the items that can be produced on the farm, can be bought from traders at far less hassle. With farmhands available for hire, hours can pass without the farming aspect even crossing your mind, which seems like a bit of a missed opportunity. Don't mention the 'Z' word! Yonder may have borrowed some of its themes and ideas, but the end result is a uniquely pleasant, and satisfying, adventure. This is by no means a deal-breaker however, and for the roughly 25 hours it took me to see all that the game had to offer, I was enthralled. 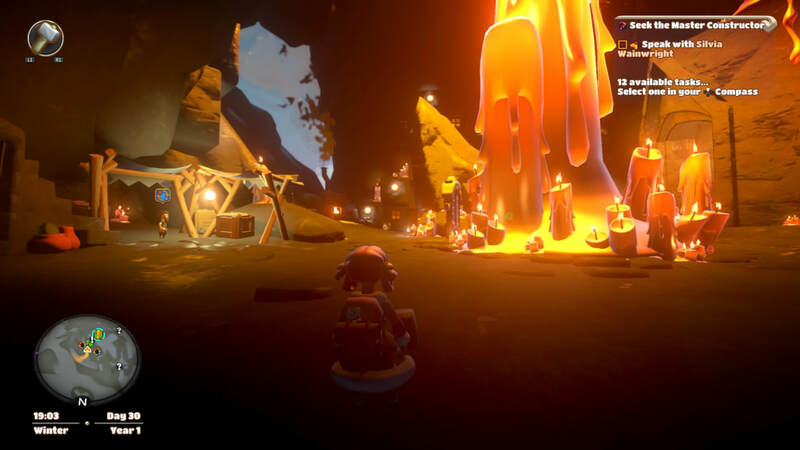 Yes, it borrows liberally from other titles, but Yonder: The Cloud Catcher Chronicles makes for a charming amalgam of modern adventuring tropes, without the necessity for combat. Those turned away from gaming by a perceived reliance on confrontation and testosterone-filled aggression, will discover a vibrant, satisfying world within which to lose themselves here. "It borrows liberally from other titles, but Yonder: The Cloud Catcher Chronicles makes for a charming amalgam of modern adventuring tropes, without the necessity for combat... It’s incredibly moreish, and very rewarding."